Weighbridges of traditional varieties, posed multiple problems in usage and accuracy and so Electronic weighbridges are a welcome change. The orthotropic weighbridges offered by Sansui provide amazing auxiliary qualities. The deck plates are available with various stiffness’s in longitudinal and transverse bearings, thus facilitating transport. 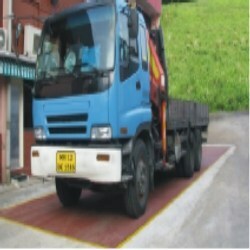 These are cost-effective, have a robust construction and are efficient to directly bear vehicle loads. Highlight features of these Electronic Weighbridges are; prevention from corrosion, easy transport, longer life and higher accuracy. The platform of these bridges is available in pit-type and pit-less type, eliminating the requirement of ramp and providing convenience in small spaces. Installation is easy, no calibration is required. These weighbridges withstand all environmental conditions. The SIC indicator has an IBM keyboard, thereby guaranteeing comfort and accuracy. There are no hidden costs and the Electronic weighbridges are economical, sturdy, user-friendly and convenient solutions to weighing requirements. Sansui is the first company in India to achieve in-house digital loadcell cornering and digital calibration at full load capacity of a loadcell with the help of highly sophisticated machine, avoiding manual labor required to lift and place the weights physically at each corner of the platform for cornering and calibration. Weigh right for future bright!